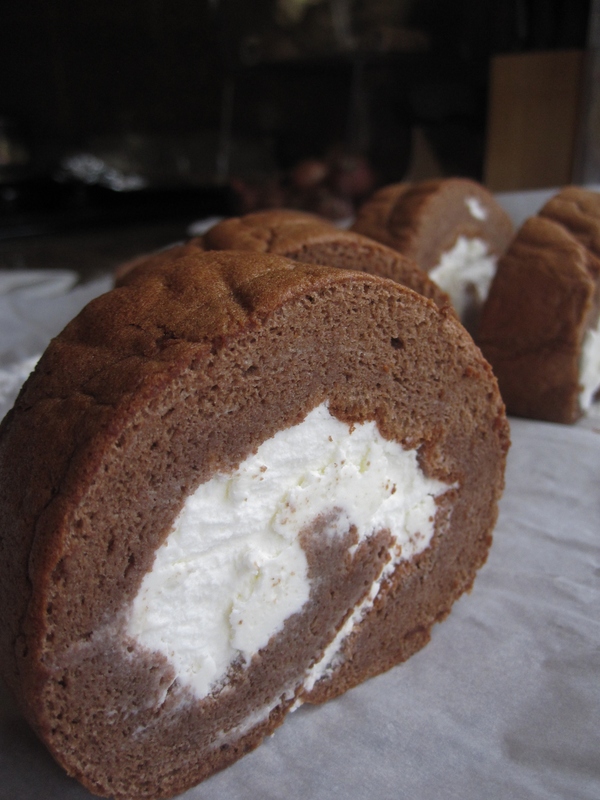 We always have chocolate cake roll with sweetened whipped cream filling, so I decided to experimenting on a new flavor– just because I’ve wanting to get rid of the lemons in my fridge since long long ago. I personally like it for its refreshing taste, but the rest of the family are not a fan of the lemon whipped cream. Oh well, it doesn’t mean I won’t make this filling anymore, because when it comes to food in our house, I RULE (that’s right, Queen of the Chennaults!). Preheat oven to 350°F, place a oven rack in the middle of the oven. Line the bottom and 4 sides of a 15 x 10 x 1 inch jelly roll pan. In a big bowl, whisk egg yolks and sugar with a balloon whisk until it is pale yellow and fluffy, scrape the bowl several times. Add in milk, oil and salt. Mix well. Sift in cake flour and cake flour in 3 batches, mix well until the batter is smooth after each addition. Add in hot water, mix well again. Whip egg whites in a dry clean mixing bowl (I use KitchenAid stand mixer) on high speed (KA speed 8) until bubbles are small and no visible clear egg whites. Add in cream of tartar and continue whipping on high speed (speed 8). 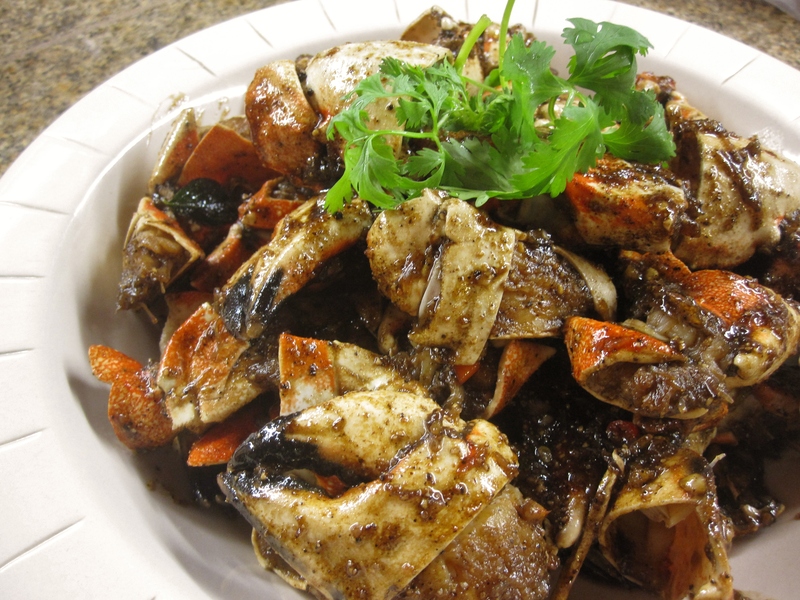 Scrape down the bowl if necessary. When egg whites turns white and the bubbles becomes very tiny, slowly pour in sugar. Continue whipping on high speed (speed 8), scraping down the bowl once, until it has a sheen appearance like a pearl. When you lift the whisk upside down, the egg whites will form a soft curl at the end of the tip (this is called soft peak. If the curl is too much then it’s not ready yet– continue whipping). Turn to low speed (speed 4) and whip for another 1-2 minutes. This is to remove any big bubbles in the egg whites so the cake will have a more delicate, fine texture. Gently fold in whipped egg whites into yolk mixture in 3 batches. Slowly pour batter onto the prepared jelly roll pan. Spread and smooth the top. Tap the pan a couple of times and bake at the middle rack of the oven for 15-18 minutes. Lightly press the top of the cake, if it springs back then the cake is done. Remove from the oven. Transfer the cake (with parchment) onto a cooling rack. 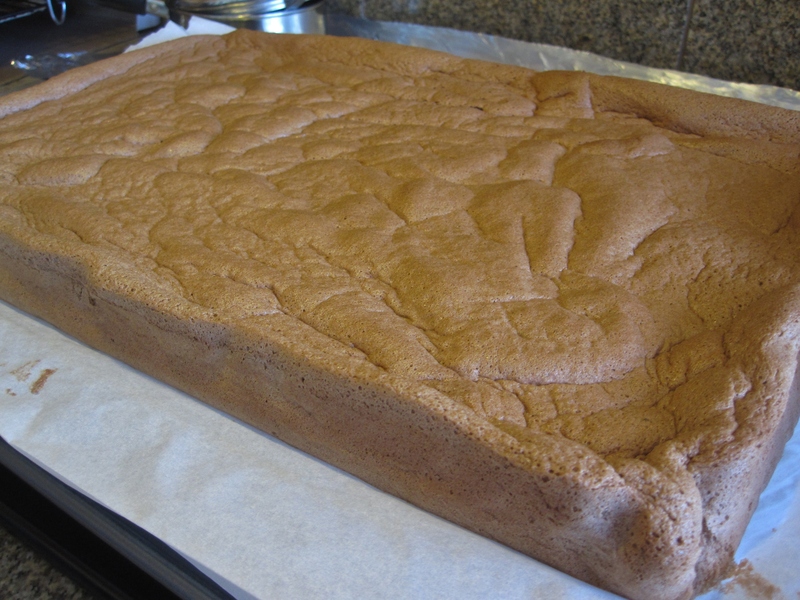 Flatten out parchment paper on 4 sides of the cake (see picture below). Cool for 5 minutes until the cake is not too hot to touch. Place another piece of parchment paper (larger than cake) on top of the cake. Carefully and quickly flip cake and 2 sheets of parchment papers over (so the cake crust will face out when rolled up). 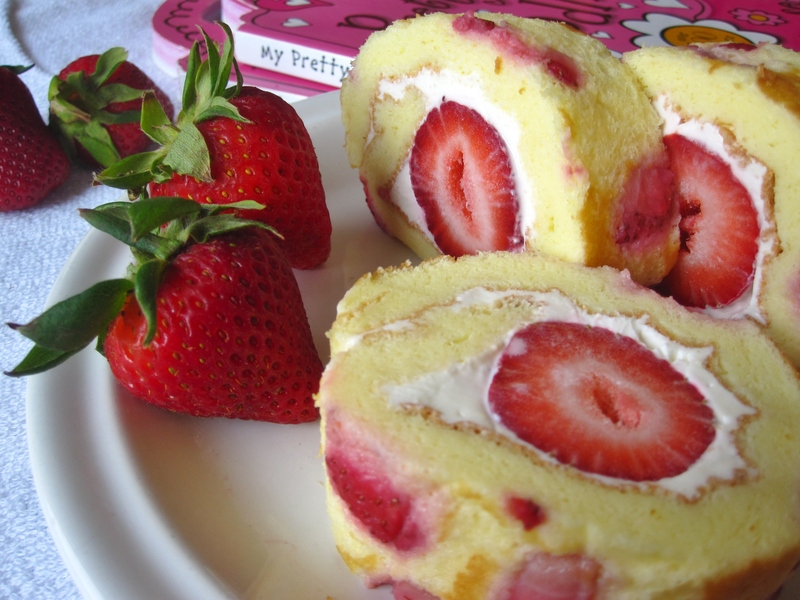 With the long side facing you, roll up the cake like a jelly roll (see picture below). This is to hold the shape while cooling and make rolling up later easier. While the cake is cooling, prepare fillings by whipping cream, powder sugar and lemon juice. Do not over whip (the mixture will start looks clumps) or it will becomes butter (in this case, just add in a little whipping cream and whip again). Unroll cooled cake, spread lemon whipped cream onto the cake, with a very thin layer of whipped cream at the end of the cake. Roll up the cake again, then wrap up with parchment paper or cling wrap. Chill in the fridge before serving. Before slicing each piece, run knife in hot water and wipe dry with a paper towel to ensure a nice clean cut. Whipping cream: As you can see from the pictures, I used too much whipping cream… should cut down to 1/2 cup whipping cream. 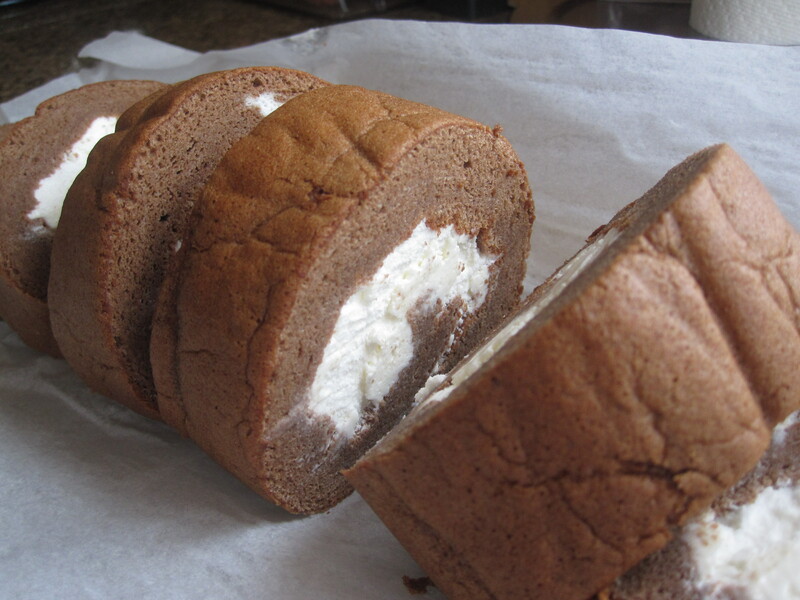 Chocolate Cake Roll with Lemon Whipped Cream 檸檬奶霜巧克力蛋糕卷– cooling the cake on a rack. Why does it have a wrinkled top crust? 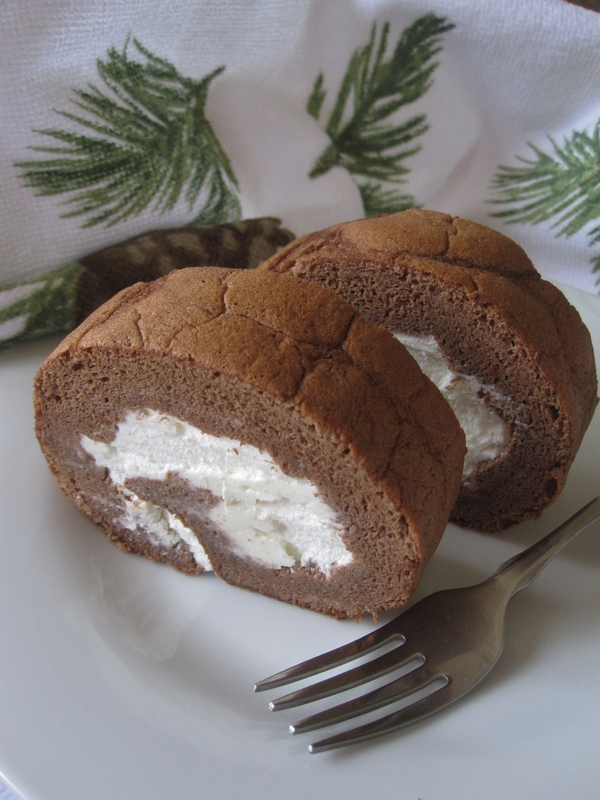 Chocolate Cake Roll with Lemon Whipped Cream 檸檬奶霜巧克力蛋糕卷– rolling up the cake and parchment papers while it’s still warm to hold the shape. 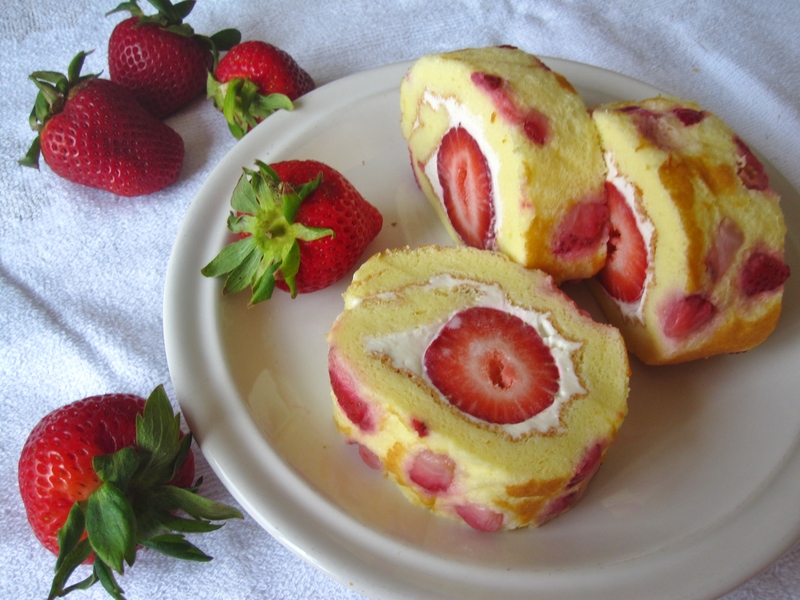 This past summer when strawberries were in season, I made this roll after seeing the beautiful photos from 静心莲的BLOG, but my roll did not look pretty like 静心莲的BLOG‘s~~ i don’t know why, but my cake roll never has the nice smooth golden top crust like many others. And this time I sprinkled too much chopped strawberries– which makes it worse to having a nice crust as the liquid from strawberries makes the crust more moist, more easily to peel off upon contact with fingers/ parchment paper/ cling wrap, and the strawberry color “smears” the cake the longer it sits. Frustrating!! I just don’t know what I did wrong as I followed the recipe to the T… On the good side, I love the flavor and colorful presentation– very different from a typical cake roll. Combine butter and milk in a small bowl, microwave until butter melts. Mix to blend well. Keep warm. In a medium bowl, whisk egg yolks and sugar with a balloon whisk until pale yellow and fluffy. Whip egg white in a separate dry clean mixing bowl on high speed (I used KitchenAid, speed 8). When egg whites becomes small bubbles and no visible clear egg whites, add cream of tartar. Continue whipping on high speed (speed 8). Scrape down the bowl once. When egg white becomes white and very fine bubbles, slowly add in sugar, one tbsp at a time. Continue whipping on high speed (speed 8) until the meringue looks sheen like a pearl. Turn down to low speed (speed 4) and whip for 1-2 minutes. This is to whip out any bib air bubbles in the meringue and creating a cake with a more delicate, fine texture. Whip until soft peak stage (when lift whisk the meringue will have a 1 inch long, slightly curl soft tip). With a spatula, gently fold in 1/3 of whipped egg whites into egg yolk mixture until blended. Sift in cake flour in 2 batches, gently fold in flour until blended before each addition. Whip egg whites again on low speed (speed 2) for a few seconds, this is because whipped egg whites will start to deflate if not used immediately. Pour yolk mixture to whipped egg whites, carefully gently fold in until all mixed well. Gradually pour warm butter/milk mixture onto spatula and drizzle onto batter in circular motion. Gently fold in again to blend well. Pour batter to the prepared lined jelly roll pan. Spread to smooth the top. Tap a couple times to remove air bubbles. Sprinkle chopped strawberries on the top. Bake in preheated oven at the middle rack for 15-18 minutes. Remove from oven. Tap cake pan on a surface to release air trapped underneath. 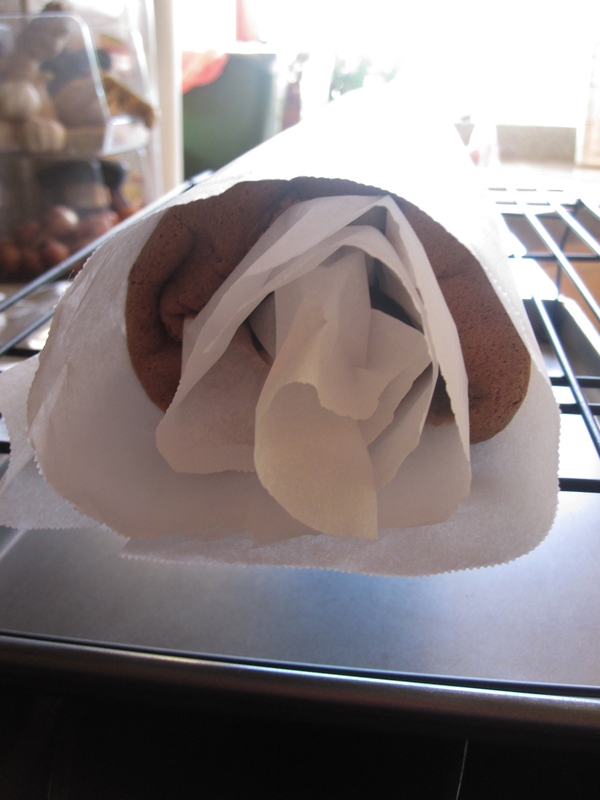 Transfer cake and parchment paper onto a cooling rack. Flatten out 4 sides of parchment paper to cool completely. While the cake is cooling, preparing the filling: microwave cream cheese briefly until it softens. Add powder sugar and sour cream, mix until smooth. Chill in the fridge. When cake cools completely, place another parchment paper (large than cake) on top of the cake and flip it over. Peel off the pan liner. Spread cream cheese filling onto the cake, with a very thin layer at the long side (farthest from you) of the cake. Line whole strawberries on the other long side (closest to you). Roll up the cake, then wrap up with parchment paper or cling wrap. Chill in the fridge before serving. Before slicing each piece, run knife in hot water and wipe dry with a paper towel to ensure a nice clean cut. Chopped strawberries: I was greedy, and I put too much! The result is strawberries draw out liquid, creating a sticky cake crust, and the strawberry color smears the cake the longer it sits… should cut down to just 1 tbsp, and more finely chopped. Cream cheese filling: Too much cream cheese filling (greedy, and don’t want to deal with cream cheese leftover), making the cake a bit rich to the taste even with the whole strawberries as part of the fillings… should cut down to 5-6 oz and possibly skip sour cream. In my family we always have Sunday brunch which is pretty much some breads or baked goods, sausages/smoked salmon, egg dish and fruits. But we ran out of of breads and baked goods, so I decided to make these new flavor pancakes, experimenting the flavor and a change for the taste. I didn’t border to look up recipes online, just used my fluffy blueberry pancake recipe as a reference. I also ran out of unsweetened cocoa powder so my pancake batter was kinda thin this time. Flavor? You can NEVER go wrong when raspberry meets chocolate. The chocolate flavor is there, even though the pancakes don’t look dark brown like chocolate (because I was short on cocoa powder), and I just love bites of tangy raspberry in the pancakes. The whole family loves this new creation. 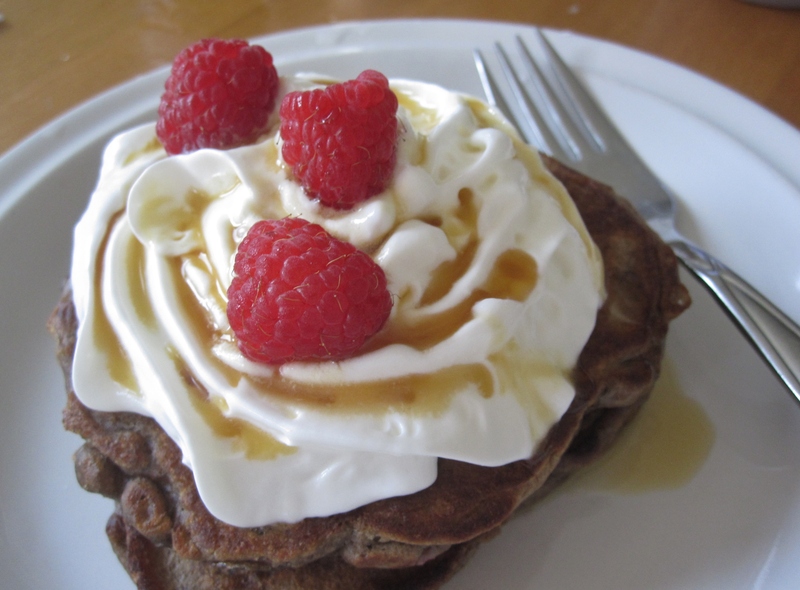 What else can you add to basic chocolate pancakes? Fresh bananas, strawberries, or none (though it will need some good amount of cocoa powder/melted chocolate to make it taste this good). In a large bowl, sift flour, cocoa powder, sugar, baking powder and salt. Make a well in the center. In a separate bowl, whisk milk and egg to combine. Add in melted butter, whisk to blend well. Pour the milk mixture to the flour well all at once. Mix to combine until the mixture just becomes moist. Do not over mix the batter. Lightly stir in raspberries. Heat a griddle or flat pan over medium heat. Drizzle a little cooking pol or spray with cooking spray. Pour batter onto hot griddle, and cook just like with regular pancakes.